The founder of the New Hope Pennsylvania Impressionist Colony, he was known as one of America's premier landscape painters in the late 19th and early 20th centuries. His style was Tonalist, which coincided with Impressionism but was not plein air nor focused on light, sunny colors. He was not innovative in style, but much admired for the strength and skillfully conveyed mood of his canvases. He avoided formula painting because he wanted to keep his work alive and spontaneous. He was born in Warren, Illinois, and raised on a farm in Painesville, Ohio near Cleveland His father was a doctor and his mother was Irish and a lover of the arts. As a boy, he did much carving from the local clay and bought his first paint at age twelve. He sent drawings and sketches to New York City editors, and received an art department job offer from Charles Parsons, editor of Harper and Brothers publishing. Parsons subsequently advised Lathrop to go back to the landscape he loved and not corrupt his natural instincts for painting with art school training. However, he turned to etching and returned to New York where he worked for The Photoengraving Company. There he met Henry Snell, who was to become his life-long friend. 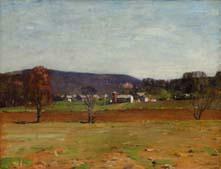 New York art dealer C Klackner exhibited his landscape painting, and although Lathrop never took formal training he learned from many artists, most especially John Twachtman, J. Alden Weir, and Henry Ward Ranger. He also painted with William Merritt Chase. In 1888, he married Annie Burt, but he failed to make much of a living for her and their two children, so J. Alden Weir helped supported them by letting them live on his property. Then Lathrop moved his family back to Painesville where he tried unsuccessfully for five years to farm. Deciding to try one more time in New York City, he entered the annual exhibition of the American Watercolor Society and won the top honor, the Evans Prize. Suddenly there was a market for his work, and because of a friend from Painesville who had settled in New Hope, Lathrop and his family from 1899 lived there at Phillips Mill on the Delaware River about forty miles north of Philadelphia. For thirty years, he had a successful career, and his home became the center of the growing art colony, which attracted many luminaries including Henry Snell and Daniel Garber. Lathrop was the unofficial father figure, and his wife the leader of the social life. Lathrop taught privately at Phillips Mills, previously having taught in the Poconos and at the Lyme, Connecticut Summer school in 1907. Lathrop built a boat called the Widge from which he painted marine scenes, sailing up and down the Mid-Atlantic seaboard. A companion on one of these trips was Albert Einstein, who was teaching at Princeton. In 1938, Lathrop perished in a hurricane off Montauk, Long Island where he had anchored his boat to escape the storm.